Introducing the NovaCHROM 4000 GC System which is ideal for permanent gas analysis and its universal applicability ensures that it is both cost effective and reliable. 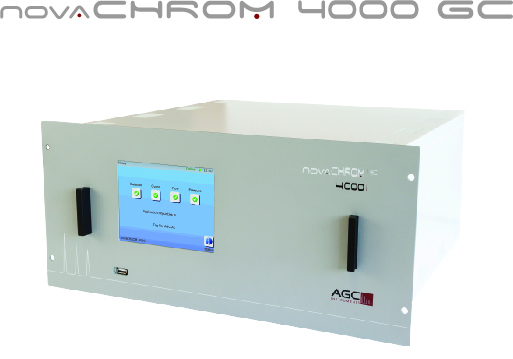 The NovaCHROM 4000 GC contains the latest GC technology based on using an industry proven detector. The AGC Thermal Conductivity Detector (TCD) is world famous. Experts in this detector since 1965, we have developed many variations of the TCD to suit our own applications and those from other GC manufacturers all over the world. We pride ourselves of being about to measure from single ppm figures to 100% concentration, this universal detector has remained a steadfast in our company where many companies also purchase it as an OEM solution for their own use. The TCD is based around the wheat-stone bridge equation. It will allow measurements from ppm to % levels with ease. Many dimensions and fits are available, but we will select the most suitable configuration for your specific application. Typical impurities seen include H2, Ar, O2, N2, CH4, CO, CO2, N2O, C2H2, Kr, Ne, Xe, CF4, C2F6, SF6, SiH4, SiH3Cl, SiHCl3, SiCl4, SiH2Cl2 etc are depending on the application and background gas. The NovaCHROM family is an on-line GC solution using an interactive 6.5” colour touch screen display and avails of our Electronic Flow & Pressure Management System. All parameters and readings are easily viewed which ensures a straightforward functionality and accessibility with minimum training required. The GC is easy to install & set-up. Depending on the design configuration, the 19”/5U configuration allows it to be retro-fitted into a standard Industrial Rack Cabinet. We offer many unique features including the AGC designed column ovens where each column is housed in its own independent temperature-controlled oven. This design, which unique to AGC, means that temperature control and stability of the column is first in its class. All fittings on our NovaCHROM 4000 GC are 1/8” Swagelok fittings which mean all our pipework (1/8” or 1/16”) have excellent seal rates and expect zero leaks. Coupled with our TrendVision PLUS Software, a perfect solution will deliver the results and standards that you as a customer would expect. For more information NovaCHROM 4000 GC please contact us directly.